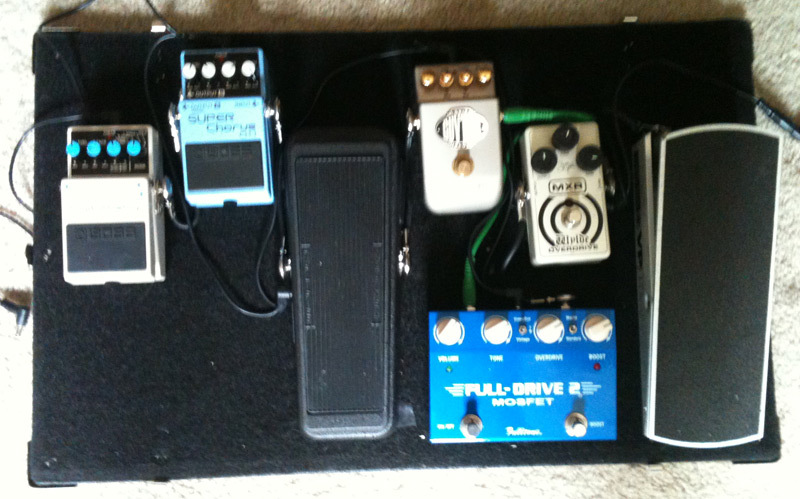 Today’s pedal line is from Donny S (@worshiprocker). If you have a pedal line (doesn’t have to be in a board) for your rig, please email me a photo, bio, description of pedals and routing to pedalline@nulleffectsbay.com. Every Friday I’ll showcase a pedal line submission. Make sure you include any links to your band or music page. First here a little background. My name is Donny. I am the Worship Director for Sunshine Acres Children’s home in AZ. I have been playing guitar for somewhere around 10 years. I have been in many hard rock bands and have played lead guitar for many churches. Here is my pedal board. 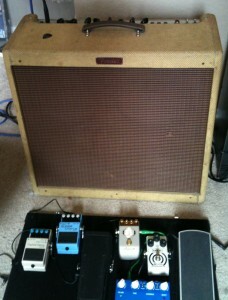 I got the pedal board from Pocket Trunks here http://stores.ebay.com/pocketrunks. It was cheap and fits my needs. Ernie Ball VP jr. –> MXR Wylde Overdrive —> Fulltone Full-drive 2 w/mosfet —-> Marshall Guv’nor (GV 2) —–> Dunlop Cry Baby —-> Boss super Chorus (CH-1) —> Boss DD-3 ——> Line 6 Echo Park (currently lending to a friend) all infront of the amp. I plan on adding the Korg Pitchblack and replacing the CH-1 with a H2O and a keeley compressor. Its a simple setup but it rocks! Let’s break it down. MXR Wylde Overdrive – I use this to boost the full-drive for leads Fulltone Full-drive 2 w mosfet – I use this one for everything, I nice crunchy drive, I roll back the volume on my guitar and it cleans up really nice. It also has a built in boost so I can get a littel extra if needed ( an I use it!) Marshall Guv’nor (GV 2) – Flat out Distortion Rock and Roll…This Pedal is my Heavy distortion..I use this for harder styles Dunlop Cry Baby – Come on we all know this pedal…. right? Boss super Chorus (CH-1) – I don’t use this much, but it adds a nice sweetness to a clean sound especially layered with some delay Boss DD-3 – I’m not a huge fan of this delay but it gets the work done. I use this more for short delay.. for soloing, not so much for riffage and U2ish sounds. (maybe I should replace it with a memory man) Line 6 Echo Park – I love this delay!.. its got tap tempo right on board, its super easy to use and you can get some trippy sounds from it. By far my favorite delay..
Well thats one of my rigs.